If you’re looking for ‘healthier’ type snack bars, it’s not hard to find them these days. 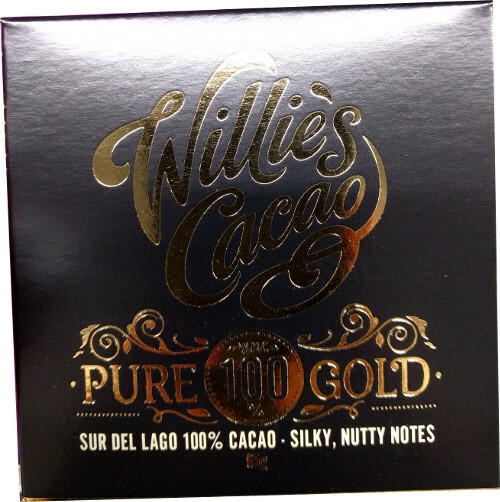 From bliss balls to protein bars, there is no shortage of alternatives to chocolate bars. 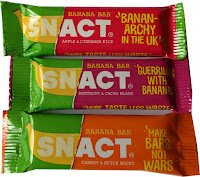 Many of the latest snack bars are made mainly from dates with other fruit and /or nuts mashed together. For example NAKD bars and Deliciously Ella. 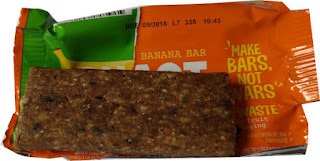 But here is a new type of snack bar, called ‘waste-fighting banana bars’ which can really make you feel good about eating them. And they’re not made from dates! 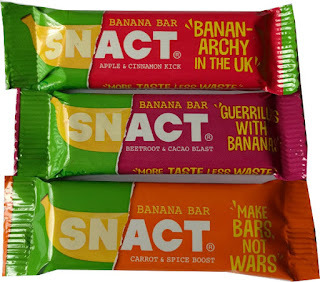 These bars are made by a company called Snact. What’s so interesting about this company is their mission to reduce food waste and make environmentally friendly snacks. I couldn’t decide which variety to buy as they all sounded so tasty, so I bought one of each. Apple & Cinnamon Banana Bar (120 calories); Beetroot & Cacao Banana Blast Bar (121 calories), Carrot & Spice Boost Banana Bar (128 calories). 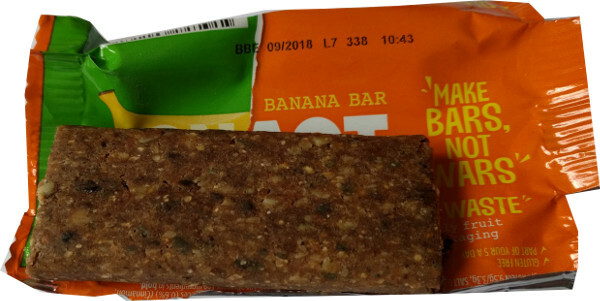 Each snack bar is 35g. The texture for all three is similar, chewy, squashy and oaty and the Beetroot & Cacao had added crunch from the cacao nibs. While all three tasted predominantly of banana, I thought the Beetroot & Cacao had an odd flavour and there wasn’t enough spice coming through the Carrot & Spice which tasted a bit, erm, musty is the word springing to mind. Although I’d fully expected to prefer the Carrot & Spice, it was the Apple & Cinnamon that was my favourite. This had a stronger taste of spice with a slight undercurrent of apple. Apple & Raspberry, Apple, Blueberry & Banana Fruit Jerky, Apple & Mango Fruit Jerky. 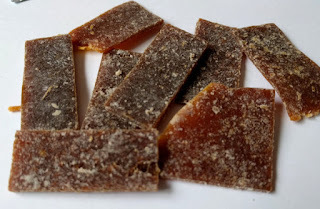 Each pack of dried fruit has just two ingredients and consists of cut strips of dried fruit. These are 100% fruit, gluten free and vegan. You can eat them straight from the pack as a snack or use them in baking. They’re very sweet and chewy and if you like eating things like wine gums, you’d probably enjoy these. As these snacks are made from dried fruit, they are all high in sugar. The jerky packs in particular are more than 50% sugar. Although this is naturally occurring sugars from the fruit, it’s still sugar, so it all gets broken down in the same way. Something to keep in mind if you’re watching your sugar intake. Nutrition per 35g bar (Apple & Cinnamon): 119 Calories, 2.8g fat, 0.4g saturated fat, 19.5g carbs, 13.9g sugars*, 2.7g fibre, 2.6g protein, less than 0.01g salt. *Naturally occurring sugars. Nutrition per 35g bar (Beetroot & Cacao): 121 Calories, 3.1g fat, 0.5g saturated fat, 18.9g carbs, 13.4g sugars*, 2.5g fibre, 3.1g protein, less than 0.01g salt. *Naturally occurring sugars. Nutrition per 35g bar (Carrot & Spice): 121 Calories, 3.1g fat, 0.5g saturated fat, 18.9g carbs, 13.4g sugars*, 2.5g fibre, 3.1g protein, less than 0.01g salt. *Naturally occurring sugars. 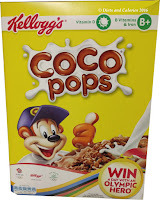 Ingredients: (Carrot & Spice): Dried banana (58%), gluten free wholegrain oat flakes, walnuts, pumpkin seeds, carrot powder (5%), dessicated coconut, spices (0.6%), (Cinnamon, nutmeg, ginger). Nutrition per 20g bag (Apple & Mango): 53 Calories, 0.1g fat, 0.4g saturated fat, 11.6g carbs, 11g sugars*, 2g fibre, 0.3g protein, 0g salt. *Naturally occurring sugars. 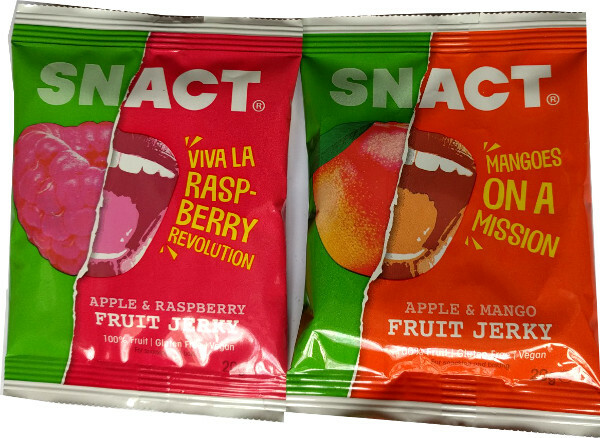 Nutrition per 20g bag (Apple & Raspberry): 52 Calories, 0.1g fat, 0.04g saturated fat, 11.3g carbs, 10.6g sugars*, 2.5g fibre, 0.3g protein, 0g salt. *Naturally occurring sugars. Nutrition per 20g bag (Apple, Blueberry & Banana): 53 Calories, 0.1g fat, 0.03g saturated fat, 11.7g carbs, 11.2g sugars*, 2.3g fibre, 0.3g protein, 0g salt. 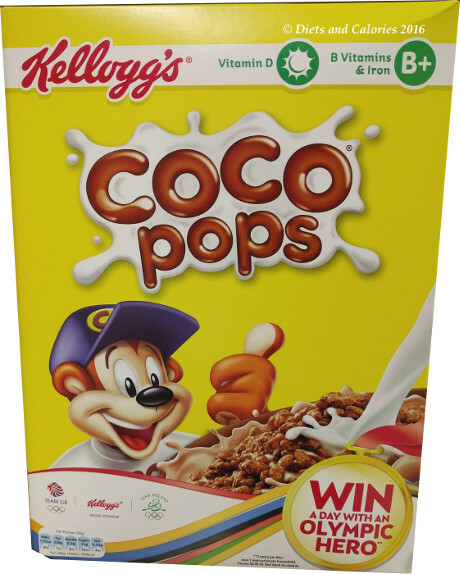 *Naturally occurring sugars. Ingredients: (Apple, Blueberry & Banana): Whole apples (70%), Blueberry puree (20%), Bananas (10%).